A very beautiful picture…the winter is not far! HI Mist Wonderful leaves edged with frost. A lovely, frameworthy photo, to hang in midsummer! Beautiful frosty leaves. I really need to get up a bit earlier on those frosty weekend mornings, so I can enjoy some of this beauty. Absolutely beautiful!!! 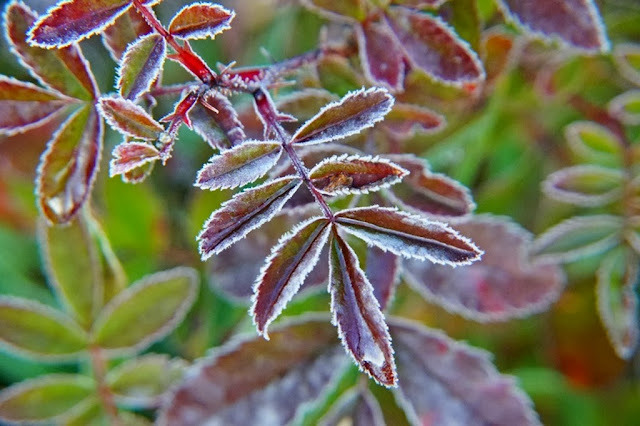 I'm hoping to get out for a frosty morning soon... so far the few mornings we've had frost it has not stayed cold enough after the sun rose high enough to catch the glitter before it melts... I know it won't be long now. Beautiful shot! Love the colors and detail. So pretty. I love that kind of frost. Beautiful frosty photo Misty! Have a great weekend! Ver nice, love the bokeh! such beautiful tones and colours.